Shri Laxmi Tour and Travel, a Regd. travel company in Haridwar offers best chardham packages & chardham fixed departure packages 2018. 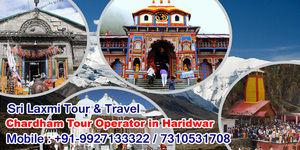 Shri laxmi Tour & Travels, a rental travel company in Haridwar offers you a range of affordable pilgrimage tour packages. Depending on your specific travel preferences, you can choose a package from httpwww.shrilaxmitourandtravels.com If If you want more in your tour, get in touch with our travel company and they will tailor the selected tour package to your individual requirements.